So I want to introduce the tyranid biomancy bomb, or bio bomb. The purpose of this list is to have a ton of stacking bio buffs. GIven this is the first post on this new blog let me start by talking about the heart of the list. the humble and forgotten zoanthrope. How many other 180 point units can put out 3psychic powers a turn! especially when each has 2 to choose from. So what powers do you need? Very offensive and very tactical power that reduces enemy strength and toughness by 1, which dramatically increases the effectiveness of your small units. Gaunts can be instant killing stuff or just laying down far more wounds. Units like devilgaunts or gargoyles get a big boost in effectiveness and survivablility in combat (17% more wounds caused and 17% fewer wounds taken). This is further enhanced by preferred enemy if you have the ability to double stack that. Allowing s6 flying mcs to deny fnp to models from swoop attacks or brainleech devourers (very useful v blood angel marines) by causing instant death. In short enfeeble is always worth taking if rolled and multiple rolls really power up your army. This is a mainstay power . Endurance gives relentless (very low use for Nids), It Will Not Die (recover wound at end of turn on 5+) and Feel No Pain. Endurance is great on Zoes and little bugs but really shines on the big mcs . Combined with the ease of now getting cover on tyranid mcs the new "always on" fnp means that nid mcs are effectively twice as survivable as they were with 5+5+ saves. It will not die just stacks to this (as does Life Leech). 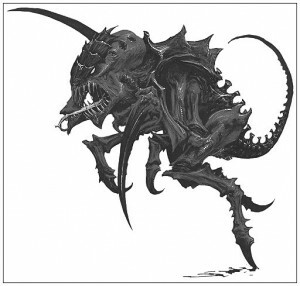 every nid unit can benefit from this power and given that it has a 24 inch casting range you can pretty much hide the Zoes and buff away to your hearts content! Again always worth taking when rolled. If you are lucky enough to roll 2or 3 if these in a unit you are off to a great start! Iron arm only affects the caster but it does provide a toughness and strength boost of d3. This is incredibly good for mcs who move into wraithlord toughness territory but they do need some luck to pick up the power. In a recent game a toughness 9 tyrant terrorised a blood angel back line shrugging off plasma and melta. This also stacks brilliantly with the previous two powers. All that said what about iron arm on Zoes? At first glance this might not seem like the most useful of powers but if you roll it twice you now have a zoey unit who can stand out front. A toughness 6 unit with 3++ and 2 wounds is a bit of a beast to shift. And becomes a fantastic tarpits unit. To hold up the nasty stuff while your own nasty stuff wanders over to the combat. Even with just one of these available in the 3 man units you can get some benefit , particularly when you lose one model the unit gets much harder to shift. The more high toughness that is dispersed around the board the harder it is for your opponent to focus fire , which improves the survivability of all your mcs. Don't forget the strength side of this power too. Especially if there happens to be an immobilised vehicle nearby ! One point in Iron Arm is that it is definitely 3rd in preference order. If you roll one of the other 2 powers first and iron arm then it may be more useful to swap it for Smite in some cases ( eg lots of termies). In most cases though I think it is too much of a toolkit power to ignore. Overall if you see bio Zoes across the table be very careful! And if you are a nid general try them out I don't think you will be disappointed! These combos are amazing. Fought Mike recently with Daemons and a Flying MC Daemon Prince using Smash half number attacks just to get his Strength back up to 4 was hilarious. Smash doesn't double your Toughness for incoming hits which too was hilarious. As I said the Bio Bomb is amazing to watch from either side of the table! Very interesting read Mike & the great part for me is I won't have to learn how to do all these things for myself I'll just keep a eye on here lol. Welgome to the blog world. Some interesting combos there. How many psykers do you need to reliably get these past the likes of shaky sticks and runes of dontcastanything? Plus it confuses the hell out of your opponent when he has to remember which model has which buff on it.